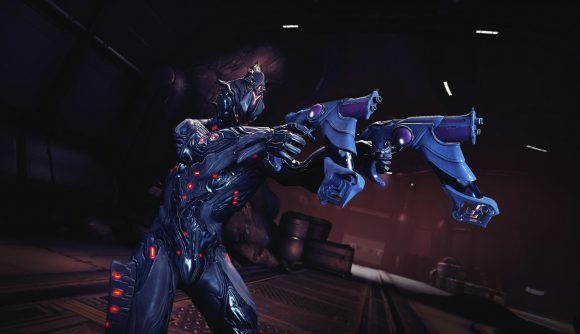 Warframe is currently celebrating its sixth anniversary, and like all good videogame birthday events that means players are getting presents. The proper promotion for the anniversary event began today, so all the giveaways are currently yours to claim, and several of them will be given out just for logging in. You’ll get the new Liset Dex skin and Excalibur Dex Noggle for logging in anytime from now until April 10 at 11:00 PDT / 14:00 EDT / 19:00 BST. Additionally, you’ll be able to pick up all the previous Dex items by completing a handful of special (but pretty straightforward) Anniversary Alerts. Those include the Dex Furis, Dex Nouchali Syandana, Dex Dakra, Dex Sybaris, and Excalibur Dex skin. Warframe’s anniversary brings it ever-closer to the 50 million player milestone, but all announcements continue to be checked with the qualifier term ‘nearly.’ The official blog provides a few more fun stats, like ‘783 billion enemies killed’ and ‘1.8 million Floofs earned.’ That’s a lot of murder and fuzzy animals, though hopefully not an indicator for the murder of fuzzy animals. You can check out the anniversary items in detail via the trailer below. Of course, you could just ooh and aah over them in the game itself. Equinox Prime hits Warframe in just a handful of days, so there’s plenty to keep you on your toes when it comes to new items for the foreseeable future.